I had been very upset about the ladybug costume not fitting right. The real problem was the bloomers that were HUGE and the corset shirt that was just odd fitting. I tied it too tight and it buckled up and folded in between the ties. I left it too loose, well...you could see things that shouldn't be seen. lol So...I went back to the store today and feeling pretty depressed about the "all sales are final" policy I began looking at new costumes when I came upon ANOTHER lady bug costume that is all one piece. I have the ladybug shoes already so I thought I'd give it a try. Again the size was XS-S. The number sizes was 2-8. Now seriously. To me a 2-8 is a ridiculously wide range. I really have a hard time seeing this dress fit anyone bigger and definitely not taller. If it were any shorter you'd have to buy a separate skirt. LOL Well the party is at my house and if it bothers me, I'll change. It looks better and that's what counts! I went to buy some goodies for the party today too. I am stocked and ready to go I think. I just need to clean clean clean tonight. I don't spend too much time in our basement. Hubby and the kids hang out down there. It's a full finished basement even with a second kitchen. I like it. It makes for good parties. The problem being that I don't spend a lot of time down there though. The kids and hubby...well they aren't as particular about tidying things up. haha So I need to get moving on that and make the girls help. They are after all the ones who mess it up. 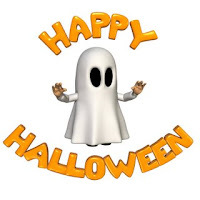 I hope everyone has a wonderful Halloween!!!! A good Halloween to you too. My daughter went out with friends and came home with sweets for two weeks, lol. Thanks for the comment and Happy Halloween. I bet they look adorable!! I have never heard of 2-8!!!! That is quite a range! Happy Halloween. Surveys For Cash? Paid Per Click? Really?